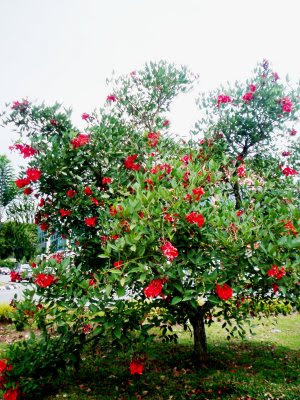 It surprises me why this lovely tree is not planted all over Bintulu. I saw this stand at Medan Raya shopping area today. 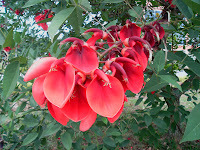 The Coral Tree ( Erythrina) has brilliant scarlet flowers that stay long on the tree. As such it is a useful tree to grow in areas where you want to see colours everyday. Having not seen one for a while now especially one that is flowering, I took a lot of close up shots of its flowers. A few are shown here. 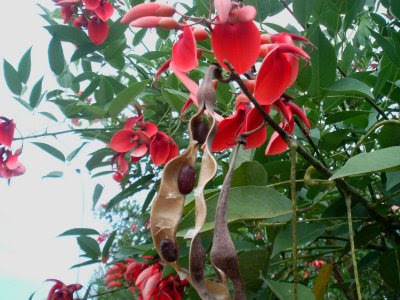 Notice the bean-like pods that contain ripe seeds below. If you are to visit most hotels and resorts this tree is usually seen in their landscaping design. I guess most landscapers love its red bunchy flowers that envelop the tree. Further I think choice is determined by its growth characteristics. It is slow growing and suitable for places near water bodies where you can watch the dark green leaves and flowers touch the water surface and reflecting its brilliant colours. We need more such trees in Bintulu. When we celebrated my son's 6th birthday , we planted this tree in our garden for the lovely flowers. It's now fully grown. My son is 23.